Start by making the relish: mix in a bowl the diced tomatoes, olives, season with salt and pepper, add the olive oil, lemon juice, and balsamic vinegar. Stir occasionally as you boil the water to cook the orzo. Cook the orzo according to the package instructions. Drain, add it to the fresh tomato mixture, mix the parsley, add the crumble feta on top, and mix gently, no need to try to fully incorporate it. Serve with a nice sprinkle of fresh lemon zest on top, if desired. 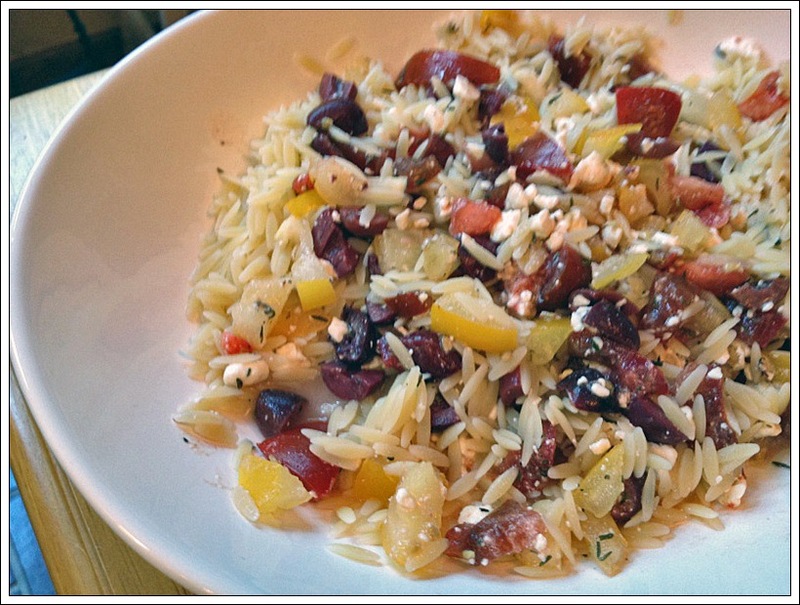 This dish is all about the contrast between hot orzo and cold relish. I would have added capers if our bottle was not 312 miles away in another kitchen. Sometimes it’s hard to keep track of what is where. Often while at a grocery store in Manhattan we are sure to have something already in the fridge, and we sure do, but the fridge in question is in Norman… and vice-versa. The bottom line: if you have capers, add them. Leftovers are great cold too. And now, for something completely different (great show, BTW)… We are often concerned with the quality of the ingredients we use in our cooking, right? Let me now share with you something equally important: the kind of labor involved in bringing an ingredient to your table. Please jump here for a very informative article published in “Not Without Salt” and learn what may be hiding behind the gorgeous tomatoes you bring home. In a medium bowl, combine soy sauce, vinegar, lime juice, oil, and ginger. Add pork to the marinade, turning to coat well on all sides. Marinate in the fridge for several hours to overnight. Remove meat from marinade, and pat it dry. Season it very lightly with salt, and grill for 7 minutes on a hot grill. Turn the meat to grill the opposite side, and grill for 6 minutes more. Without opening the grill, turn the heat off and let the meat stay inside for 5 minutes. Remove the meat from the grill, tent it with foil, and let it rest for 5 minutes before slicing. Heat 1 tablespoon of olive oil in a medium pan over medium-high heat. Add the orzo and cook for 5 minutes, stirring often. Add 2 cups of water and lemon zest, season with salt and pepper, and bring to a boil. 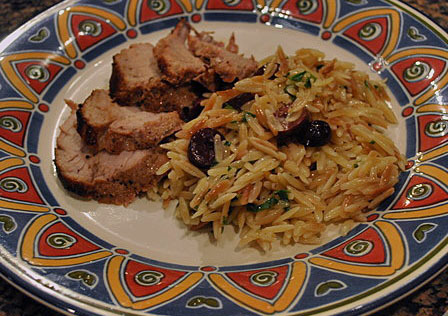 Reduce heat to medium; cover, and simmer until orzo is al dente and liquid is absorbed, 10 to 15 minutes. Remove from heat. Stir in olives, parsley, lemon juice, and remaining tablespoons of olive oil, if desired (I omitted this step). Comments: What a great dinner this was! Ready in less than 30 minutes, all I had to do was make the marinade at lunch time (but you can do it in the morning, if you don’t go home for lunch), and by the time we came home from work, dinner was a cinch to make. I used the 7-6-5 grilling method for the pork tenderloin, because it works well with pretty much any type of marinade or dry rub. It is easy to take care of the rest of the meal when all you have to do is set a timer and move the meat around when it goes off. 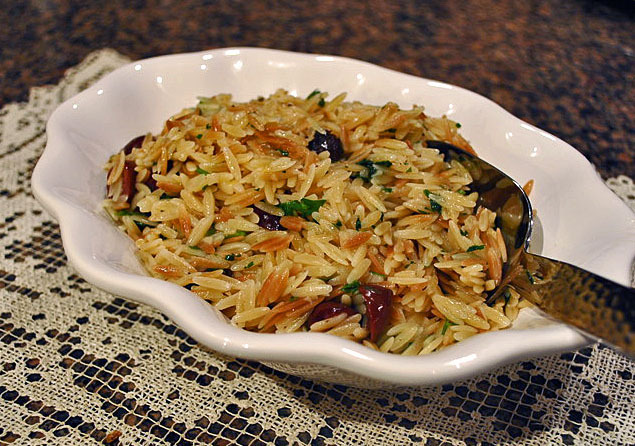 Toasting the orzo is what makes this side dish so special. I’ve used a similar method before in one of the simplest and greatest recipes I’ve made last year, the “Carrot Nib Orzo”. 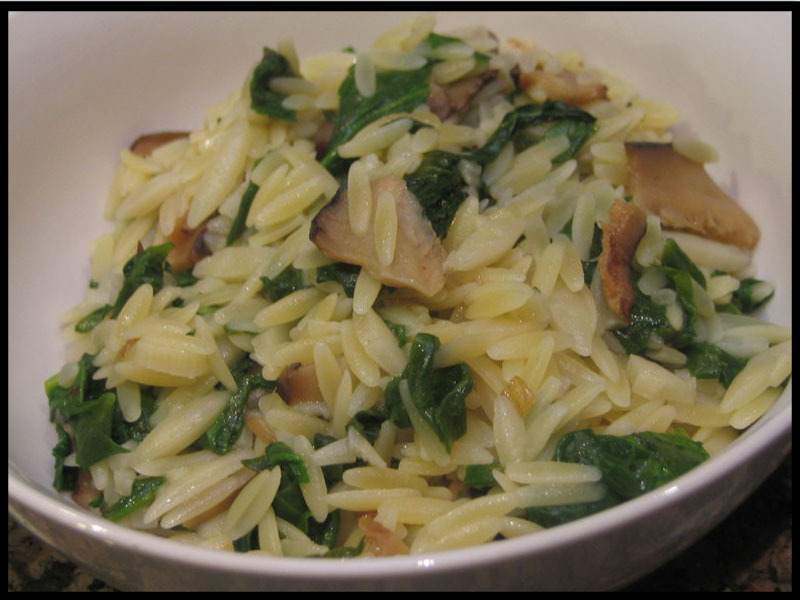 If until now you’ve only treated orzo as a normal pasta, boiling in salted water, please try either of these recipes, you will be more than pleasantly surprised by the improvement in taste and texture. My Brazilian nature often predisposes me towards rice, but the more I cook orzo, the more I like it. It might be more versatile than rice, it cooks faster, and it’s absolutely fool proof, all of which adds to its charm. The inspiration for this recipe came from an old Fine Cooking magazine, but I simplified it quite a bit because the original seemed a tad too busy: too many flavors fighting for attention. This pared-down version was a winner! Start cooking the orzo on a large pot with salted water (it should take around 9 minutes). Heat the olive oil on a large skillet and saute the shallots, lightly seasoned with salt and pepper. Add the sliced shiitake mushrooms, saute until they start to get golden brown. Add the chopped spinach, cook until it begins to wilt. At this point, if the orzo is not cooked yet, turn the heat off and reserve. 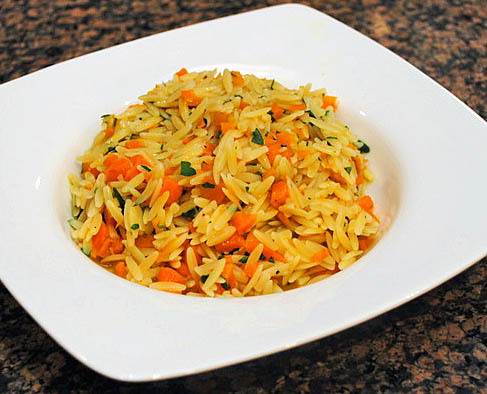 When the orzo is almost cooked, remove 1/4 cup of the cooking water and reserve it. Turn the heat back to medium on the skillet with the spinach mix, squirt lemon juice and zest, season with salt and pepper. Drain the orzo and add it to the skillet, mixing well. Add some of the pasta water if necessary. Adjust seasoning with salt and pepper. If desired, sprinkle parmiggiano-reggiano on top. This was a quick dish to put together! 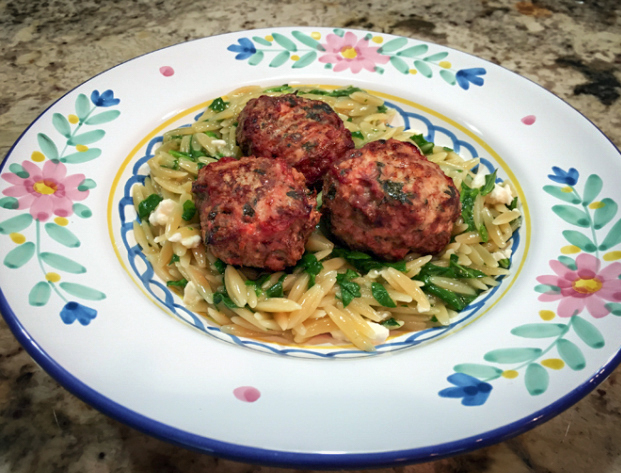 It will drop into my regular rotation of meals for busy weeknights, keeping the orzo/spinach/lemon foundation and playing with other options: black olives, sundried tomatoes, roasted red bell pepper, artichoke hearts…. receita em portugues na proxima pagina….